It has been learned through my own independent investigations that Mayor Annise Parker is taking extravagant and lavish trips, all while indirectly undermining the efforts of Council Member Helena Brown to gain Korean support for a direct Incheon-Houston flight, which means jobs and revenue for Houston. And the “media” has done nothing to expose the hypocrisy. 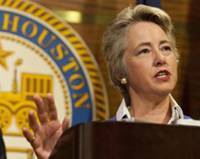 Mayor Parker reportedly took 60 people to Asia. Finally, Mayor Parker went to New York to make an appearance on the Colbert Report, conflating celebrity with public office. Who knows what is accomplished with such trips? WHAT IS CERTAIN, is that Helena Brown accomplished her objective: to facilitate greater business ties between China, Taiwan, Korea, and Houston, and further, to promote a direct flight from Incheon to Houston. What did Parker’s trips achieve, apart from her absence? Recently, a concerned citizen who wished to remain anonymous, contacted me as an independent journalist with information she had obtained via public information request. The following observations are based on this information. One of the interesting findings, especially considering recent press coverage, is that the Mayor solicited private funds for both her San Francisco excursions and her trip to Asia. Is this not one of the criticisms of Helena Brown, i.e. attempting to pay for business delegates with private funds? It has also been discovered that Wanda Adams pursued private methods of financing on her sojourn to Ghana. It is apparent that “standards” vary depending on the subject of inquiry. How exactly are these private sources? The trip to Beijing alone cost Mayor Parker in excess of $9,000. Parker spent almost as much as Council Member Brown did on her trip to Bejing, and she only went to Bejing, whereas Brown went to three separate countries for a comparable amount. Surplus funds were used by Brown. Not so with Parker. Why the dishonesty? Google was the only tool necessary to determine that the GHCVB was publicly funded. What does Parker have to gain by engaging in such duplicity? In addition to my findings concerning the many excursions of Parker, I have also discovered what appears to be the appropriation of city resources (both logistical and potentially financial) in the support of President Obama and his fundraising needs. Such behavior is wholly unethical and inappropriate for a Mayor of Houston. I am awaiting more information on the financial element, and no accusations of financial malfeasance are yet being made. Politicizing the office by abusing city resources (of any kind) to support a national political figure, is most certainly lacking in judgment. But her very next statements cause doubt as to the veracity of her prior comments comments: "He will have coattails [Obama]," Parker exclaimed, "and we're doing what we can to make sure that those coattails reach as far as they can." How do such statements reflect on Parker’s perception of appropriate distance between partisan stumping and her day job? The natural boundaries between personal political support/endorsements and city obligations must be observed by Mayor Parker (especially as her office maintains such strict standards for others). In all of the aforementioned findings, it is clear that Parker functions at the height of hypocrisy. She may be “Batman,” as she egotistically contended when on The Colbert Report, but is she what Houston needs?